The Drag and Drop editor allows you to create print items using layers and elements. Templates made for this editor offer complete flexibility in moving and editing text, images, and shapes. 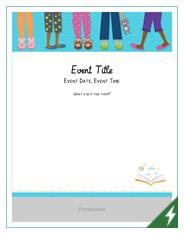 However, if you’re looking for the ability to create lists (for example, lists of books or lists of events), please use the templates made specifically for the Lists Editor. To create an item in the Drag and Drop editor, under a promotion at the Promotion tab click the Create Item link then select Print: Drag and Drop. Drag and Drop templates and items will be marked with a green banner in the corner of the thumbnail. Note: Templates can also be selected from the Home tab (at the top of LibraryAware). Click Create under a template you would like to use. In your template, all elements can be managed separately. You can delete, move, or change the opacity of the elements in your item. Watch our training session recording for more information on the Drag and Drop editor. Note: Items and templates previously created in the Lists Editor cannot be opened in the newer Drag and Drop editor. If you would like to edit an item or template that you previously created in the Lists Editor, you will need to create a new item in the Drag and Drop editor. How do I add and edit images? How do I add or change branding in an Item? How do I move an element? How do I rename an item? When you are done working in the editor, save or print your item using the buttons in the toolbar. For more information on publishing your Item, see the Printing & Publishing Items section of Help.